The Carroll County Retired Teachers Association was organized by twelve local teachers June 22, 1962. A Constitution and Bylaws were adopted in November 1962. From the early organization there were two outstanding members: Dr. John Nelson Mowls, City Superintendent of Schools in Pa, often called "father of the tenure law"' and James Steer, active in People to People and in the restoration of the one-room schoolhouse and steam mill at Petersburg. This later inspired the CCRTA to prepare the school for visitation during the Algonquin Festival every year by young students. A video was made by Virgil and Claire Springer, Bernice McClester and Cicely Worthington which is now in the County Library. McClester, in 1990, directed a project that erected a monument at the cemetery of the Golden Age Retreat in memory of persons buried in unmarked graves, some nameless. At the request of Helen Skinner, director of the Carroll County Library, McClester recruited members of CCRTA to organize several thousand slides of Edwin and Doris Preston, avid world travelers from Leesville, who had given many materials from their travels to the library. Under her guidance also, visual and audio tapes were made based upon the history of one-room schools in the county and on two outstanding women in the community, cousins Mary Herron and Velma Griffin. CCRTA has a history of supporting the Carroll County District Library. It was dedicated in 1994 with Harry Anderson as President for many years. Other outstanding contributors in various roles have been Evelyn Jones of Dellroy, Margaret Longsworth and Livonia McCreary. McCreary was cited by Oliver Ocasek for her lobbying efforts for Carroll County before the State Library Board for funding. 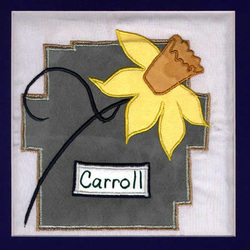 Carroll County has the distinction of being the "Daffodil County" of Ohio. Many years ago Daisy Johnson, Home Demonstration Agent, obtained many bushels of daffodil bulbs which were given to folds to plant along the highways and byways of the county. Every Spring we are blessed and have a renewed spirit when we see the yellow blossoms of these daffodils.